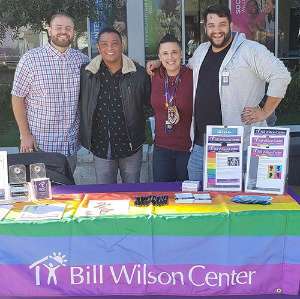 Bill Wilson Center's LGBTQ Outreach Program supports youth of all sexual orientations, gender identities, and gender expressions, and validates all persons within the Lesbian, Gay, Bisexual, Transgender, and Queer/Questioning communities. Our program works directly with youth to connect them to housing, education, and mental health resources within Bill Wilson Center. Based on the practices of the Family Acceptance Project, our LGBTQ Outreach Program encourages youth to discover their support systems, connecting with their natural supports, and building family connections in their own community. Our program supports LGBTQ youth exploring their identities by providing educational and skill-building workshops that encourages youth to validate different identities and promotes allyship for those who wish to support LGBTQ friends and family. With free weekly educational and skill-building workshops, youth are invited to participate in regular wellness and self-care activities that focus on managing the stress and anxieties felt by LGBTQ youth. The activities offered at the Drop-in Center focus on promoting a safe and supportive learning environment that allows youth to share their life experiences freely, providing emotional support as well as community support for LGBTQ youth. By actively and openly promoting the exploration of LGBTQ identities with youth during their transitional age, the LGBTQ Outreach Program works to change the conversation around sexual orientation to be one that is inclusive and affirming of all persons—building a community through conversation. Our LGBTQ groups are confidential, drop-in, support groups, designed to allow LGBTQ youth to explore issues and concerns they are facing in their everyday life with others from their community. These groups are conducted in a safe and supportive space by staff who deeply care about providing services to LGBTQ youth. All sexual orientations and genders are welcome! Thursdays 7 - 9 p.m.
Saturdays 3 - 5 p.m.
For information contact the Chris Fucetola, BWC Connections Coordinator, at (408) 925-0233 or cfucetola@billwilsoncenter.org. • Has your child “come out” to you? • Are you struggling with your child’s gender identity or sexual orientation? • Are you unsure how to parent or support your LGBTQ child? • Is there a conflict between who your child says they are and your culture/religion? Join one of BWC Connection’s Parents of LGBTQ Youth Support Groups to learn more and find other parents in similar situations. For more information contact Debra Pope, LMFT at (408) 278-2563 or dpope@billwilsoncenter.org. Our support groups are open to any adult with a child or family member who has come out as gay, lesbian, bisexual, transgender, pansexual or queer. Our meeting times and locations are flexible to meet the needs of the attendees. This is a safe, confidential and supportive place for family members to learn more about what these identities mean and get support for the parent. Parents are able to meet other parents going through similar changes in their family. Groups discuss and process what these changes may mean for the parent, the child and the family.